We read with interest the article by Gogos and colleagues in a previous issue of Critical Care reporting that there are major differences in the early status of the innate and adaptative immune responses between sepsis and severe sepsis/shock in relation to the underlying type of infection . In patients with acute pyelonephritis and intraabdominal infection, expression of HLA-DR on monocytes was significantly decreased among patients with severe sepsis/shock compared with among patients only suffering sepsis. This difference was related to an unfavourable outcome in patients with acute pyelonephritis. The authors considered the decrease of CD14/HLA-DR co-expression to be an index of immunoparalysis and bad prognosis . An altered expression of HLA-DR on the monocyte surface, however, is not synonymous with a global downregulation of cellular reactivity. The term cellular reprogramming thus appears the most appropriate to define the events occurring among circulating monocytes and other immune cells during severe sepsis/shock . In addition, a growing set of evidence undoubtedly indicates that, despite the Toll-like receptor/IL-1 receptor-associated kinase/NF-κB pathway being blocked, other alternative signals are active simultaneously in septic patients [3–5]. Recently, we analysed a cohort of 17 patients who met the diagnostic criteria for sepsis  (see Figure 1a overleaf). Our findings demonstrated that these patients showed reduced responsiveness to a lipopolysaccharide challenge (which is called endotoxin tolerance) but their monocytes were not paralysed. 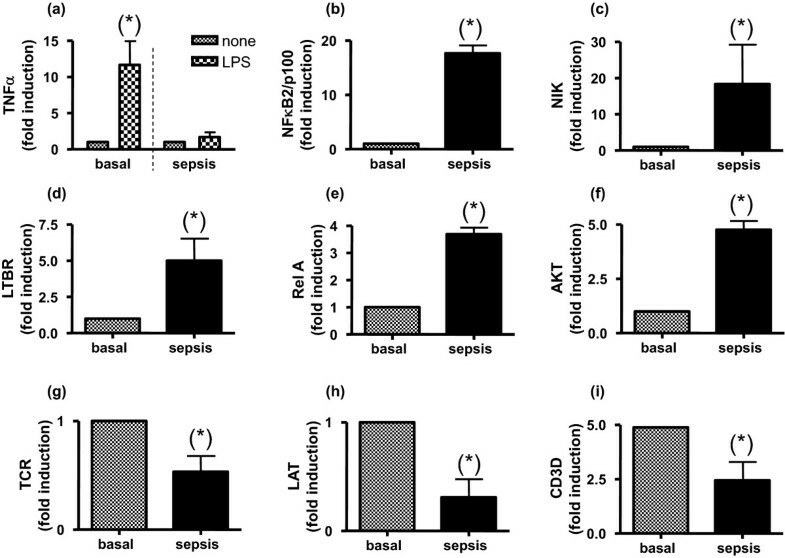 As Figure 1a to 1f shows, despite an evident downregulation of TNFα production after ex vivo lipopolysaccharide challenge, septic patients' monocytes exhibited high levels of key genes from several pathways (NF-κB2/p100, NF-κB-inducing kinase, lymphotoxin β-receptor, v-rel reticuloendotheliosis viral oncogene homologue A (p65) and serine/threonine protein kinase). These data suggest an alternative activation of their innate immune cells as occurs in endotoxin tolerance. In contrast, we observed a negative regulation of several genes of lymphocytes such as T-cell antigen receptor, linked for activation of T cells, and ΔCD3-TCR complex (Figure 1g to 1i). These results are in line with previous observations that patients who suffer from an endotoxin tolerance have an impaired immune adaptative system [3, 4]. Alternative responses are activated in monocytes from septic patients. (a) to (f) Monocytes from septic patients (age 51 ± 12 years, mean ± standard deviation), who met the diagnostic criteria for sepsis, were isolated (n = 17). Blood samples were taken when they met the sepsis criteria for the first time. The following exclusion criteria were imposed: malignancy and chronic inflammatory diseases, treatments with steroids or immunosuppressive drugs during the past month, hepatic failure (serum aspartate aminotransferase and/or alanine aminotransferase level >100 IU/l; prothrombin time <60%, total bilirubin level >60 μmol/l), renal insufficiency (plasma creatinine level >200 μmol/l), AIDS, virus B orvirus C hepatitis, gestation, and age >70 years. Total RNA was then isolated and the levels of (a) TNFα, (b) NF-κB2/p100, (c) NF-κB-inducing kinase (NIK), (d) lymphotoxin β-receptor (LTBR), (e) v-rel reticuloendotheliosis viral oncogene homologue A (p65) (RelA) and (f) serine/threonine proteinkinase (AKT) were determined by real-time quantitative PCR. (a) In the case of TNFα, induction levels were also analysed when monocytes were challenged with lipopolysaccharide (LPS) (10 ng/ml) for 3 hours, ex vivo. (g) to (i) Lymphocytes from septic patients were isolated (n = 17). Total RNA was then isolated and the levels of (g) T-cell antigen receptor (TCR), (h) linked for activation of T cells (LAT) and (i) ΔCD3-TCR complex (CD3D) were determined by real-time quantitative PCR. The fold induction with respect to the basal is depicted. *P < 0.01 septic phase versus recovery phase (1 month afterwards). The analysis of several parameters of the immune response (expression of HLA-DR on monocytes, and subsets of lymphocytes) seems unsuitable to characterise the complexity of septic patients' immunological status, because it rapidly changes over time. Identification of polymorphic genome variations that may influence susceptibility to sepsis and alter its outcome, however, is a new approach in sepsis research.